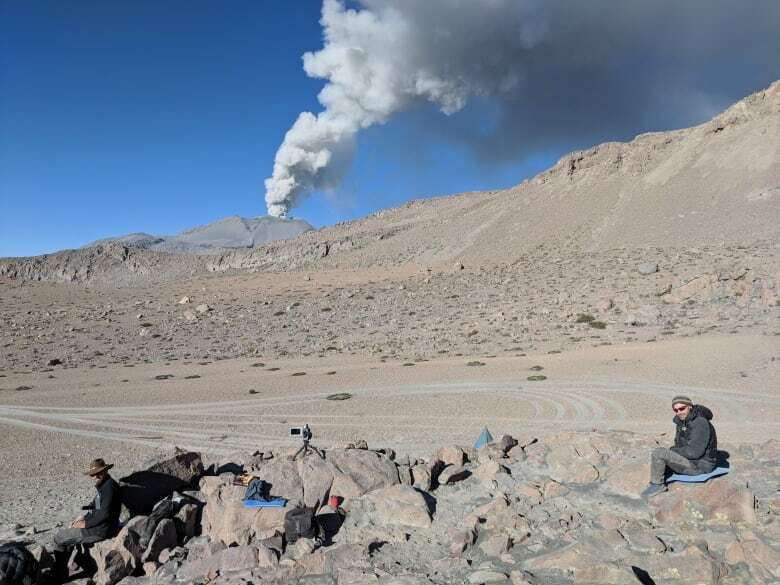 As Johan Gilchrist and a team of researchers ascended Sabancaya — an active volcano in the Andes of southern Peru — the volcanologist heard an alert he would never forget. "All of a sudden I hear on the radio from the French team 'panache, panache!' That means plume, like an ash plume. So I look up at the volcano and sure enough, it is going big right now," he said. "I mean for some of us it is the first time we've seen an eruption this big and we're within 10 kilometres of it. I had to crane my neck backwards to look up at this eruption cloud. It's farther back than I've ever had to crane my neck to look at any skyscraper or mountain." As it turned out, that moment would be repeated every four-and-a-half hours, like clockwork. Sabancaya has been spewing massive amounts of hot ash into the air for nearly two years. This summer, Gilchrist, a Ph.D student in geophysics at the University of British Columbia, travelled to Peru to gather critical data for his research. Working alongside an international team, the aim was to help Peruvian scientists forecast the volume, speed and direction of ash plumes so they could effectively warn neighbouring communities of potential danger. Gilchrist expected the trip to be an adventure — after all, he was going to get up close and personal with an active volcano. But he didn't expect that a trip, which included altitude sickness, freezing temperatures and many days covered in filthy soot and ash, would also be the time of this life. The adventure began with the gruelling drive to the volcano. The road was "kind of like a logging road in B.C. Very rough, and we're just bouncing around," Gilchrist said. He likened it to "when you get a paint can and you put it in that shaker before you buy it. I was just getting my brain rattled around." 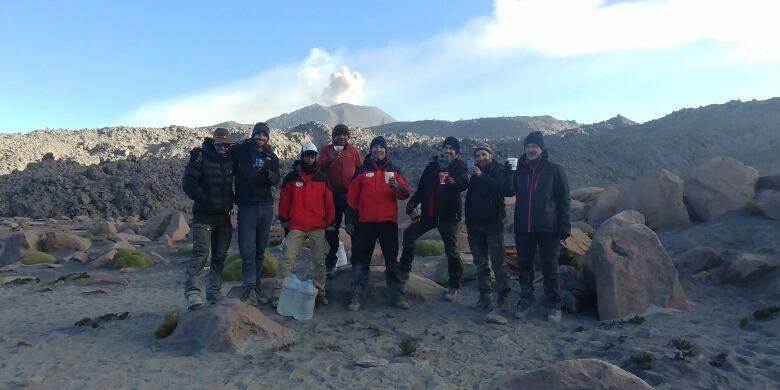 Gilchrist said the team was grateful to avoid both altitude and car sickness, and eventually arrived at their camp on the slopes of the 6,000 metre high Sabancaya volcano. It was a landscape reminiscent of Mars: dry, dusty and rocky. But living that close to an active volcano was sometimes more uncomfortable than exciting. The high altitude brought bitter cold, especially at night. During the day, on the other hand, the intense solar radiation brought extreme heat and risk of serious sunburn. The camp was grimy. Tents, clothes and equipment quickly became filthy. Fine volcanic ash was a big problem as it was everywhere, getting into eye, ears and noses, and even clogged the zippers of the tents. The other issue was soot from cooking, since the only fuel available for camp stoves was smoky automotive diesel. The team, which included scientists from Peru, France and UBC, brought a huge range of equipment to study the eruption. Lava wasn't the concern with Sabancaya, but the vast plumes of ash the volcano was producing. 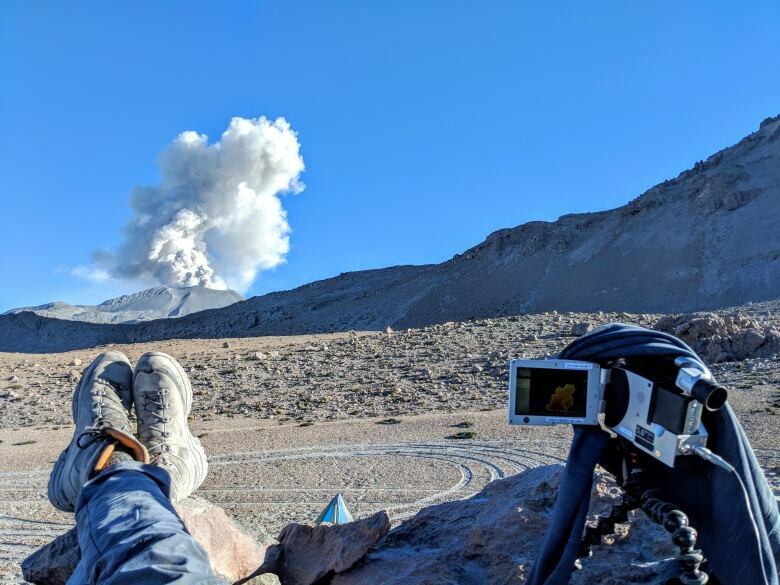 Thermal cameras and a brand new Doppler Radar system would allow them to take the pulse of Sabancaya and estimate the volume and speed of the ash being ejected with each eruption. The immediate goal of the research was to help the local scientists forecast potential danger. In the longer term, it was to better characterize how volcanoes produce ash plumes, which in other locations can cover landscapes metres deep and reach high into the atmosphere, disrupting air travel. The few weeks Gilchrist and his colleagues spent studying Sabancaya were enormously productive, providing them with data they could spend the rest of the year analyzing. Now that he's back in Canada, Gilchrist reflects on his trip to Sabancaya, and particularly seeing that first eruption, as career-defining. "It was a very visceral moment for me," Gilchrist said. "In that moment, not only am I seeing an eruption for the first time, it also validated the last five years of my work and it dispelled any uncertainty I had with the decisions of what to study for the past five years. Everything came together in this moment for me. It just all made sense."